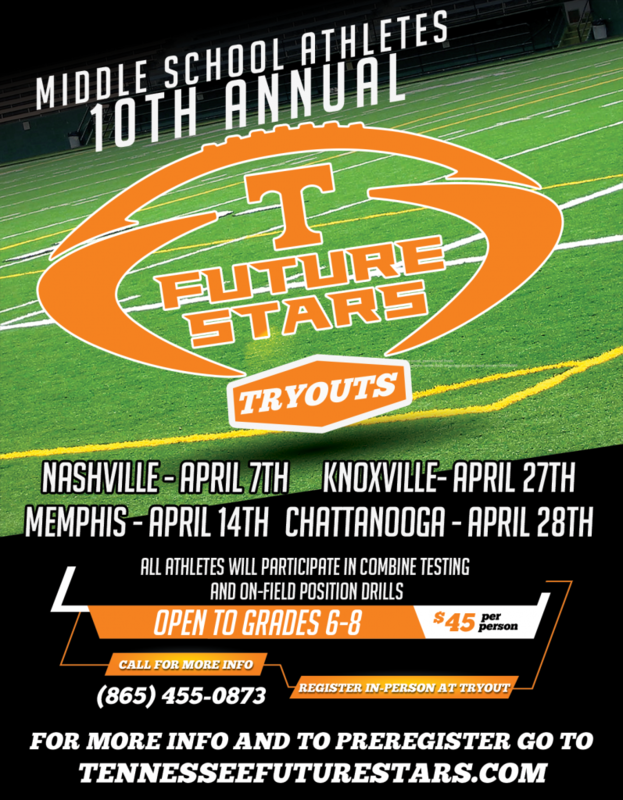 Future Stars Tryouts are a non-contact tryouts, and players should wear cleats and shorts. Future Stars will provide a tryout t-shirt for all participants. All players are encouraged to wear a mouthpiece during tryouts. Tryouts are $45 per player(PAY CASH ONLY @ TRYOUT) and each player will get a Future Stars Tryouts t-shirt and combine results. Tryouts are based on the current school year grade. All quarterbacks and kickers should BRING THEIR OWN BALL. They may (or not) get to use there ball we recommend bringing in case we have a lot tryout and we have enough footballs. The 7th Grade quarterbacks will throw with a TDY (Official Middle School size ball) and the 8th Graders will throw with the (Official High School ball). Kickers need to also bring any tees. All players should bring drinking water to the tryouts. We plan to have an open concessions at each Tryout but its not guaranteed. We also ask that ALL LINEMEN please bring their HELMET and MOUTHPIECE. Tryouts will consist of a height and weight station. Kids will compete in a mini pro style combine, recording their times in the 40 yard dash, shuttle (5-10-5) and Broad Jump. The ”Combine” portion of the event is hosted by Next Level Training out of Knoxville, TN. Players will then have the opportunity to tryout at the position of their choice on both offense and defense. ALL positions will go through a 1-on-1 period, “compete drills”. These drills can get competitive! We remind everybody that you are trying to make a team and kids should tryout for the position that gives them the best chance to make the team, which may not be the position they play for their respective teams. The players will be evaluated by the Future Stars Staff and graded on their ability and attitude. Please note that this is a state-wide all star game. Just because your child does not make the team, does not mean they are not a very good player. Just means that spots are limited at each position and every great player could not make the team. No player that made a previous Future Stars team is guaranteed a spot on the present team.